London, UK. 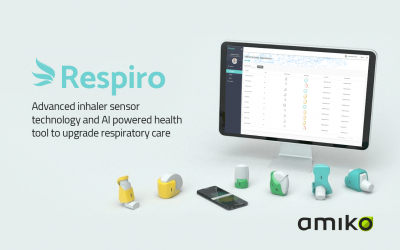 Dec. 18, 2017 — Amiko Digital Health Limited (Amiko), a company that develops advanced medication sensor technologies and AI-powered digital health tools, today announced the closing of a new financing round, led by Sanner Ventures and Breed Reply. The funds will be utilized to expand Respiro, Amiko’s innovative respiratory disease management platform, and support the company’s mission to upgrade the current standard of respiratory care. Respiro offers a platform of medication sensors and connected health tools, enabling real-time monitoring of medication use and patient health. At the core of the platform: Respiro Sense, the technology that powers the world’s most advanced medication sensors. Combined with respiratory devices such as inhalers, the sensors automatically track the patient’s inhalation profiles to record when and how well patients use their medication and to help monitor lung health. Founded in 2014, Amiko has headquarters in central London and ISO 13485 certified laboratories in Milan. Today, Amiko serves commercial, institutional, and individual customers in Italy, Germany, France, Spain, UK and the Netherlands, and is growing to become a global provider of advanced therapeutics data and digital disease management services, empowering patients, healthcare professionals, and payers to realize a shared vision of a digital health enabled future.